Determined to make his own way, Kline worked as a cartoonist for his high school newspaper and managed to escape his small town to attend Boston University's School of Art, between 1931 and 1935. Boston offered him a wealth of opportunities: not only did his instructors help familiarize him with modern art, but he also learnt much from the city's private and public collections. After leaving, he studied briefly at the Art Students League in New York. He then went to England where he enrolled in the Heatherly's School of Art in London. It was there that he met his future wife, Elizabeth V. Parsons, a former ballet dancer who was working as an artist's model at the school. She returned with Kline to New York in 1938 but would later suffer a mental breakdown and spend time in mental institutions. The first few years back in New York proved difficult for Kline. He was forced to take odd jobs: he painted murals in bars and sold illustrations to magazines. At this point, his work was shaped by his love of Old Masters such as Rembrandt, but in 1943 he met Willem de Kooning and began to frequent the Cedar Bar, where he met Jackson Pollock and Philip Guston. Around 1947, under the influence of de Kooning, he also began to abandon figuration and experiment on a large scale with a gestural, abstract technique. He had already began to explore an austere black and white palette in a series of ink on paper sketches, but now he brought the technique to canvases and employed house-painting brushes to create broad strokes of black criss-crossing white canvases. In part he was inspired by de Kooning's black and white paintings of 1946-49, and - although the story is apocryphal - it is said that de Kooning also inspired him to scale up the work, after he encouraged him to examine it using an enlarger. "A four by five inch black drawing of a rocking chair," Kline recalled, "...loomed in gigantic black strokes which eradicated any image, the strokes expanding as entities in themselves, unrelated to any entity but that of their own existence." 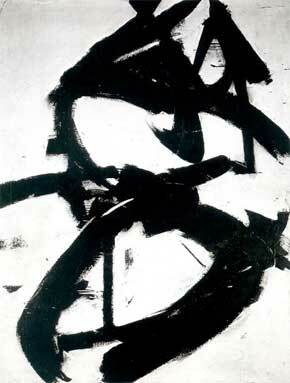 The pictures, which resulted from this revelation, were first exhibited at the Charles Egan Gallery in New York in 1950, a show that established Kline's reputation. 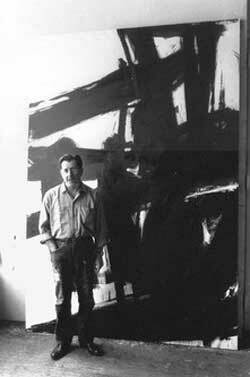 Critics have long debated whether Kline's black and white paintings were inspired by Japanese calligraphy. The suggestion first surfaced in reviews of his breakthrough show of 1950. However, the artist denied it, claiming that his inspirations came from unconscious sources. When asked to explain the meaning of his work, he refused, saying that he wanted the viewers to feel the effects of the composition unhindered by suggestion. Instead, he emphasized the non-symbolic character of the work, and what he called "painting experience." He was supported in this by critics such as Clement Greenberg, who focused on the importance of abstract form in art, and sidelined discussions of sources or content. Kline also put a distance between himself and contemporaries such as Mark Rothko and Barnett Newman, whose art expressed an urge to transcendence. And, although his gestural approach might seem to place him close to de Kooning, Kline was less interested in wild expression than in the isolated gesture itself. By 1955 Kline was experimenting with color once again - using planes painted in different hues to evoke a more complex sense of space. His style also became looser, and by the early 1960s, in works such as Red Painting (1961), some of his pictures were almost monochromatic. 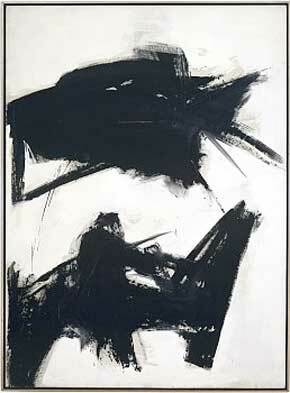 By this stage, Kline's reputation was secure as a leading Abstract Expressionist. He was exhibiting continuously both in the U.S.A. and abroad, and was selected to show at the Venice Biennale in 1960, along with Hans Hofmann, Philip Guston and Theodore Roszac. In 1961, his works were also included in "American Vanguard", an exhibition organized by the United States Information Agency, and which toured countries throughout Europe. Such exhibitions have since come to be seen as an important facet of the American government's efforts to advance itself as a guardian of free expression in the midst of the Cold War. He died unexpectedly of heart failure on May 13, 1962, aged only fifty-two.